There is a new weekly farmers' market just a few blocks from my house. I love it. I walk out my front door, cross the park, and make my way along tree-lined Noe Street until I see the little pop-up stalls. It's just the right size - not too big, not too small. Inspiring without being overwhelming. I came home the other night with a basket overloaded with all things spring and made this asparagus salad. Nothing fancy, the asparagus and broccolini got a quick stint in a hot skillet along with a bit of olive oil - just long enough to take that raw edge off. Then it was out of the skillet and onto a platter along with some sliced radishes, a chunky lemon-pinenut dressing, and a bit of shaved Parmesan. Tasty. I'm going to make it again tomorrow and serve it over some (pan-fried) scallion gnocchi I have in the refrigerator. A few notes - for fun I cut the asparagus into coin-shaped pieces here, so they'd match the radish slices. It's a bit of extra prep, but worth the effort. And then there's the dressing. The dressing is lemony and bright, and a bit like a coarsely chopped pesto minus the basil. You could certainly add chopped basil later in the season (or mint) for a variation. I have you make a bit extra with this recipe in case you need a bit extra for pasta, grains, or salad greens that you might serve over, under or around this. Vegans, you can make this by leaving out the Parmesan. Wash the asparagus and broccolini well and set aside. Make the dressing by whisking together the lemon juice, salt, shallot and olive oil. Stir in the pine nuts. Set aside. To cook the asparagus, place a splash of olive oil along with a couple pinches of salt in a large skillet over medium-high heat. When the pan is hot add the asparagus and broccolini. Toss well and cover the skillet with a lid. Cook for one minute. Stir again, taste a piece, and cover again for another minute - but only if needed. You don't want to overcook the vegetables here, they should be bright and with a bit of bite to them. 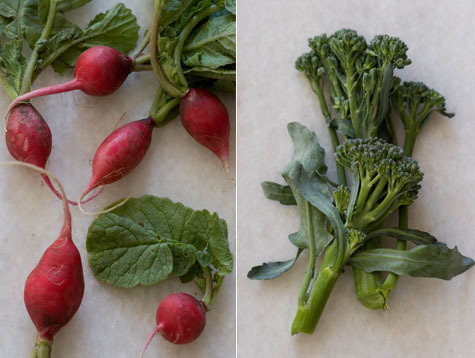 When the vegetables are cooked, remove them from the heat and stir in the radishes and lemon zest. Taste, add a bit of salt if needed. Toss with 1/3 of the pine nut dressing, adding more as needed - as I mention up above, you might have a bit extra. Turn everything out onto a platter and finish with some shaved Parmesan. A favorite stir-fry recipe. Asparagus and tofu form the base, but it has quite a lot going on beyond that. You get a bite of tang from the lime, heat from the red chiles and fresh ginger, mint and basil cool things down, and a touch hoisin sauce gives you just enough sweetness to balance it all out. A great broccoli recipe, one of my favorites! Tiny green florets, crisp apples, crunchy shallots, candied nuts and slivered red onions are tossed in a barely sweet, creamy almond vinaigrette. Add baked tofu or pan-fried tempeh and you can easily turn this side into a main course. A spring twist on a panzanella recipe. This panzanella features asparagus, spinach, and peas with hearty, garlic and time toasted bread cubes.